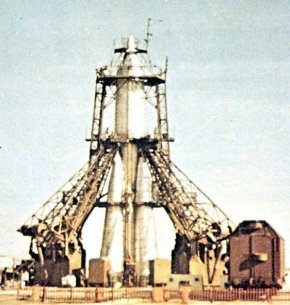 The Sputnik launch vehicle was the world's first launch vehicle to reach Earth orbit. It was developed from the Soviet R-7 ballistic missile (see "R" series of Russian missiles) and comprised a central core of four RD-107 rockets, clustered around which were four tapered booster stages each containing four RD-108 rockets. All the engines used liquid oxygen and kerosene. During ascent, the boosters were jettisoned, leaving the core to place the Sputnik satellite in orbit.